Adam Levine's Bald Head Causes Total Heartbreak on Twitter—Read His Hilarious Response! Monday night's episode of The Voice was definitely filled with lots of excitement, but there was one little distraction that we can't avoid discussing: Adam Levine's head. The singer ditched his luscious locks and debuted a freshly shaven head during the show. To make matters even more confusing, the episode (obviously shot at two separate times) showcased his locks both before and after the big cut. The whole thing caused quite a bit of chatter—mostly distress—on Twitter and resulted in some hilarious comparisons (many instigated by Blake Shelton's nicknames for the singer) and even better memes. WATCH: Blake Shelton makes out with Adam Levine?! Seeing Adam Levine bald makes my heart hurt..
As expected, Shelton hopped in on the Twitter commentary, adding his own two cents. "Thank goodness #Gandhi was there to help you make that decision, @gwenstefani," Shelton wrote alongside the hashtag "#AdamsBald." LOL! 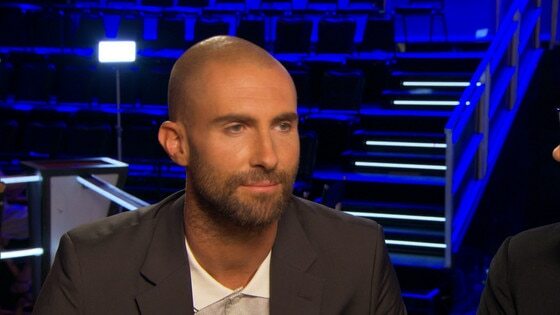 After the Internet uproar, Levine finally spoke out to defend his drastic change and remind everyone that his hair is fine. It was his decision to shave his head—he's not actually balding! "Excuse me. Lex Luthor was bald. I have ‘shaved' my head," he tweeted. "Meaning, shaved by choice. Big difference. Ok?!! Ok?!!" Of course this isn't the first big hair change Levine has made in his lifetime. Just a few months ago he broke fans' hearts when he showed off a shaved head for the first time. Before that, the singer shocked the world in 2014 when he dyed his tresses platinum blonde. In our honest opinion, he can pretty much pull off any style and still manage to look hot! Are All of "The Voice" Coaches Shaving Their Heads? !